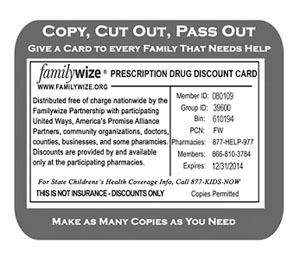 If you don’t have health insurance, or need medicine not covered by your insurance plan, you need the FamilyWize prescription drug discount card being distributed by United Way of Greater Augusta. The card could lower the cost of your medicine by an average 30 percent or more. The United Way of Greater Augusta is providing these cards free-of-charge to everyone in the local community. There are no age restrictions, no income restrictions, no limit on how many times you can use it and no waiting to get a card. In fact, you can cut this one out and use it today. You can also download a free prescription card here. FamilyWize cards also can be obtained from all Kmart pharmacies and can be used at Martin’s, Kroger’s and Wal-Mart pharmacies. For more information on what pharmacies accept Family Wize cards in your area please call United Way of Greater Augusta at 540.885.1229.